Mom, the Intern: How do we look upon sin? How do we look upon sin? About a month ago while we were staying with my parents, my sister came home from church. It was the first Sunday of the month -- Fast Sunday -- which means instead of a regular sermon, members of the congregation are invited to share their personal testimonies from the pulpit. She mentioned how a number of congregants related sentiments like, "No matter how far you fall away from Him, God will always, always love you." My sister said her bishop did eventually get up and remind the congregation that while God does indeed love us and always will, He "cannot look upon sin with the least degree of allowance." Which means, He doesn't allow sin to enter His kingdom. I've been thinking about this a lot, especially recently. Here are my somewhat-jumbled, hopefully-coherent thoughts on the matter. First, I do agree no matter how much we sin, God will always love us. Remember, He is our Father. And a parent's love is (or at least, should be) unconditional. No matter how many times my children unroll the toilet paper, punch each other in the face and generally behave like holy terrors, I will always love them. And when they get older and make really terrible choices, even when they shatter my heart into a million pieces, I will always love them. And God, being a perfect parent, will always love us, too. Even when we break HIS heart, over and over again. God loves us, and that is why he looks upon sin with the least degree of allowance. Think about it, parents: if we love our kids so much, why do we make rules for them? Isn't that oppressive and cruel? No -- we love our kids and we want them to become the best people they can be. We don't want them going into society, unrolling toilet paper all over the place, punching other people and being holy terrors. So, we set boundaries to help them turn into decent adults and live up to their potential. But, we ultimately allow them to choose, committing to loving them no matter what. Here's another reason why God looks upon sin with the least degree of allowance -- His Beloved Son, Jesus Christ, paid the ultimate price in suffering the sins of all humankind. God could never tolerate sin in the face of his Son's beautiful and heartbreaking Atonement. If so, He would cease to be God. God does not want us to sin, but He knows we will. That is why he provided a Savior. But Christ did not atone for our sins so we could make mistakes with wild abandon. He requires us to follow Him, be baptized and keep His commandments. He asks that when we sin, we repent in full humility. We need to correct our sinful behaviors before He will cleanse us. The Atonement is not a free car wash we can simply ride through without even exiting the vehicle. Instead, it is Christ standing with a bucket of soapy water and a sponge, ready to help us wash the car by hand. He requires our best effort. That is the only way a true change of heart can occur. Now, how should we look upon sin? Some may argue that we should be like God and not tolerate any sin of any kind, ever. Even others' sins. But to that, I say, do you intend to obey all the commandments? Don't forget Christ's admonition to "judge not, that ye be not judged" (Matthew 7:1). I am so glad it is not my responsibility to decide who is a sinner and who isn't. I cannot possibly understand the hows, whys and whats of everyone on Earth, but God and Jesus Christ do. So, I'll gladly leave the judgment to them. Also, we can look to Jesus Christ's example. During his mortal life, He associated with sinners. He did this not to accept or excuse their behavior, but to invite them to change and follow Him. How are we to help others come unto Christ if we abandon them the second they slip up? We can't. In fact, by doing so, we may even encourage them to turn further away from Him. "And why beholdest thou the mote that is in thy brother’s eye, but considerest not the beam that is in thine own eye? Thou hypocrite, first cast out the beam out of thine own eye; and then shalt thou see clearly to cast out the mote out of thy brother’s eye." In other words, if you're going to help people remove the splinters from their eyes, you better be darned sure you don't have a two-by-four hanging out of yours. Now, what about when society as a whole is engaged in sinful behavior? Again, as baptized members of the Church, it is our duty to "stand as a witness of Christ at all times, and in all things, and in all places." We can do this by living the commandments and being a good example of righteousness. We can testify of truth to others when the Spirit influences us to do so. We can exercise the right to vote for or against measures that coincide or conflict with our moral convictions. But, we must not judge others. So, how do we look upon sin? With the least degree of allowance -- in our own lives. We should repent immediately when we realize our mistakes. We shouldn't allow misdeeds to fester and corrupt us. We can help others by living as an example, testifying of truth and exercising our right to vote when applicable. 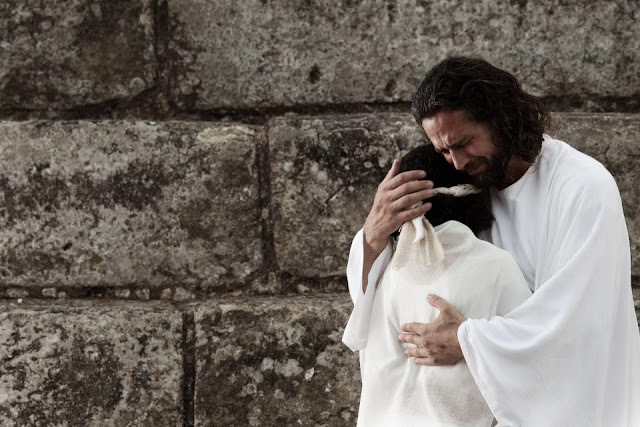 And most importantly, we can also reach out in love, as the Savior did. But He is the Savior of the world, and He has the power to judge the sins of others where we do not. We must be careful not to cross that line. -- Love them as you always have. Be kind and respectful. -- Continue to associate with them, since abandoning others goes against the principle "love thy neighbor." Have them over for dinner, game night, play dates, etc. Invite them to your family functions and events. -- Share your belief in gospel principles when the Spirit invites you. -- Avoid contention and arguing. --Let go of what you can't control. Remember, we're all on life's journey together. We all have different struggles and strengths, and NONE of us have mote-less eyes. God knows us perfectly and He will judge us fairly. And while He does love us and will always love us, He does not want us to sin. He wants us to repent and be made whole so we can inherit all the blessings He has in store for us.